If you really care about your privacy in internet communication, you probably will arrive at Kontalk Messenger. Kontalk is a XMPP-based secure communication platform, it supports end-to-end encryption and federation, and is free software for both the client and the server programs. 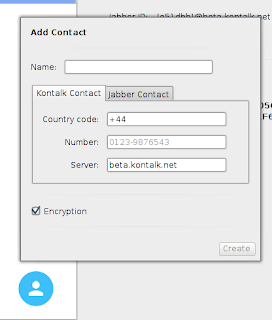 If you interested enough, read this FSFE article about privacy and Kontalk FAQ. 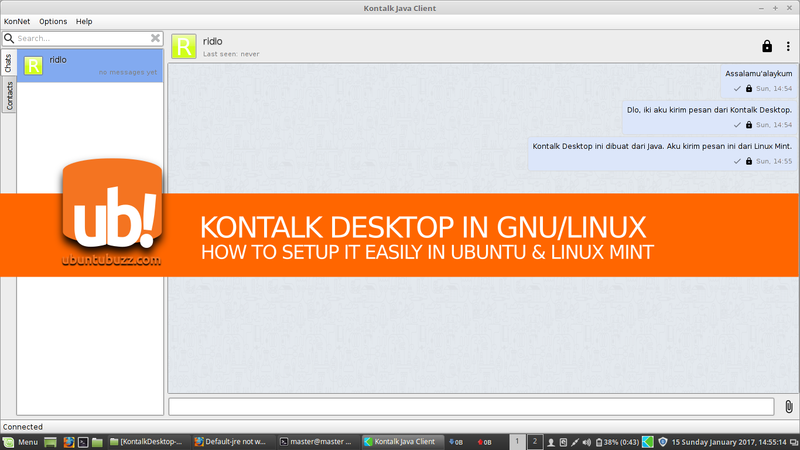 Kontalk is currently available in Android (phone), GNU/Linux, MacOS, and Windows (desktop). 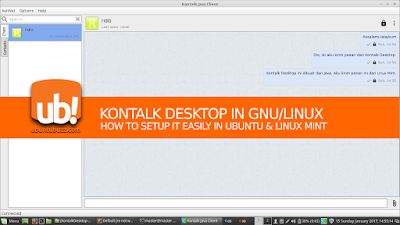 This article explains how to install Kontalk Desktop in Ubuntu & Linux Mint. 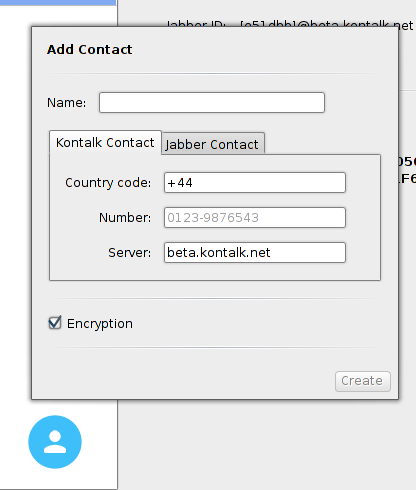 Download Kontalk Desktop here https://github.com/kontalk/desktopclient-java/releases and choose the newest version. For now, the latest version is 3.1.2. So for this condition, you will download the file named KontalkDesktop-3.1.2.zip. Extract the zip package into a folder in your $HOME in desktop. This will create a folder named KontalkDesktop-3.1.2. This creates two items inside that folder: a lib folder and a KontalkDesktopApp.jar program. Right-click on the KontalkDesktopApp.jar file > Open With > OpenJDK Java 8 Runtime > Kontalk window will appear. In your phone, open Kontalk program > Settings > Maintenance > Export personal key > choose a folder of your phone > press OK. This will create a new file named kontalk-keys.zip on your phone memory. 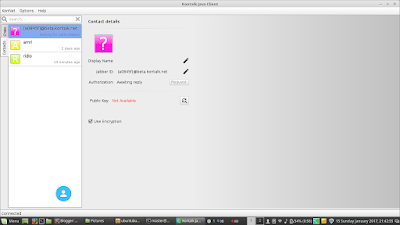 Send the kontalk-keys.zip from your phone to your desktop GNU/Linux. You may send it either with MTP (cable) or with another way. Place the file to the KontalkDesktop-3.1.2 folder, the same folder with the .jar program. 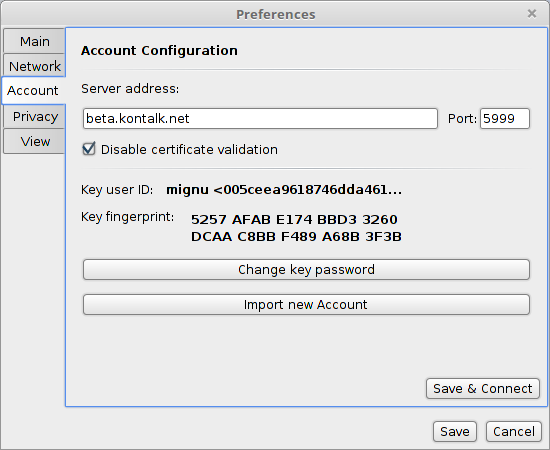 If you encounter some error saying Kontalk can not connect to the server, open Preferences > Account try to check Disable certificate validation > click Save & Connect. This is a workaround I found myself, and if you know better workaround please let me know. 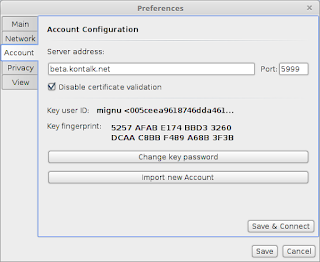 Now, you should be connected successfully to the Kontalk server. The sign of being connected is the "Connected" message on the bottom-left corner of the window. You can chat with your friends with Kontalk Desktop now. You can add new contact by clicking on blue-circle button on the bottom.